The Highway Department is a dedicated team that provides snow removal, sweeping and resurfacing of Lysander’s 96-plus miles of roads owned by the Town of Lysander and 30 miles of County roads. The Highway Department also maintains town-wide drainage, infrastructure, and provides care for abandoned cemeteries. The Highway Garage is located in Radisson Corporate Park and provides on-site maintenance, repairs, and storage of vehicles and equipment in support of the Highway Department’s extensive responsibilities. The Town's E-Recycling drop-off is also located here at the Highway Garage. See link below for acceptable materials or call us at 315-635-5551. The Highway Department’s top priority is reacting to the prevailing weather conditions to maintain public safety on 120-plus miles of Town and County roads in Lysander. Plowing, sanding and salting are the primary services provided by the Highway Department, with experienced drivers as the backbone of the program. Residents of Lysander are seldom “snow bound”. It takes the Highway team 3 – 3.5 hours to make one full pass through the Town. This first pass is typically completed before school busses need to be in neighborhoods and before the morning commute. School and Highway personnel are in constant communication to ensure the safety of everyone involved in school transportation. It is a fact that when a plow pushes snow it creates a windrow at the edge of its path. Snow is pushed into driveways and it is impossible to retrace a route and clear these windrows. When the snow banks get too high and reduce visibility, they are cut back or hauled away. As a courtesy to residents, the Highway Department will repair damage caused by snow removal operations. This includes lawns, driveways and possibly mailboxes. Please contact the Highway Department at (315) 635-5551 to report any damage. The area will be examined and repaired as soon as is practical. Keep garbage cans and recycling bins in your driveway, well back from the road and away from the path of the snowplow. Stake the edge(s) of your lawn. Mailboxes and posts are replaced only if hit by snowplow equipment, so check your mailbox, newspaper box and the supporting posts in the fall. Perform the “shake test”. If the post is already shaky, the post is unstable and will not withstand the pressure of flying snow. Check your mailbox for loose or missing parts. Replacement mailboxes are standard black or white metal boxes, installed on a 4×4 post. The Town is not responsible for replacing designer boxes, posts or any style of newspaper box. (If you have such a box, you may want to consider removing it for the winter months and replacing it with a standard box.) Mailboxes are installed per US Post Office regulations. If you utilize a private snow removal service, make sure you and your contractor are in agreement with the needs of your household. We cannot coordinate Town wide snow removal with private contractors. There is no overnight parking on any Lysander streets November 1 to April 15 from 2 a.m. to 7 a.m.
Drive carefully, allow extra time and distance for stopping. Be considerate of snow removal equipment and allow as much room as possible. Educate your children to the dangers of making tunnels and playing on or near roadside snow banks. As a courtesy to the residents, every Spring the Highway Department surveys every street in the Town checking for property damage. We will repair damage caused by our snowplows. We will not repair damage caused by private snowplow operators. Repair includes lawns, driveways and possibly the mailbox. Please help us by reporting potholes on Town roads. Call the Highway Department at (315) 635-5551 with the location. Report potholes on Onondaga County roads at (315) 435-5452. Contact the State at (315) 458-1910 to report potholes found on state roads. The Town is not responsible for fixing potholes in pavement located on private roads or other private property such as shopping center parking lots. Driveway aprons are the responsibility of the property owner. Patching a pothole during cold weather is a temporary fix. Permanent repairs need to be completed during warm weather. If the pothole keeps returning during the cold weather we will continue to re-patch until permanent repairs can be made. The Highway Department will attempt to notify residents whenever road surfacing is performed on their street. Please bear with us during road work, we always try our best to complete the work as quickly as possible. Street sweeping in the Town of Lysander is an ongoing process with the bulk of activity in the Spring. The Highway crew works its way through the neighborhoods at least twice during the season. So if you have missed one collection, there will be another! Residents are asked not to sweep debris into roadways or gutters. Do not create piles with the material as it creates a dangerous situation for pedestrians, bicyclists and motor vehicles. 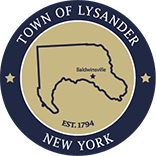 The Town of Lysander DOES NOT provide yard debris removal. The Onondaga County Resource Recovery Agency (OCRRA) operates two Waste Drop-Off Sites (also known as “transfer stations”). Each provides a variety of waste disposal and recycling services to small businesses, contractors, and residents of the OCRRA service area.